For you Paul Daley fans that were hoping MMA’s other organization would be knocking down the cheap shot artist’s door, don’t hold your breath. Following Daley’s intentional post-fight left hook to Josh Koscheck’s face at UFC 113, Strikeforce CEO Scott Coker said he believed a certain altercation his promotion hosted last month played a roll in the UFC’s decision to immediately cut ties with the slugger. 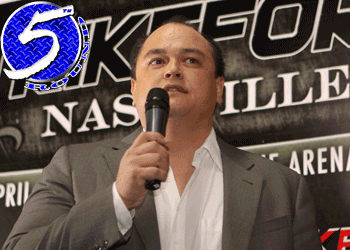 “I’m not the UFC and they run their business the way they run it and I have no idea what thought process went into it, but I’m sure it was influenced by what happened [at “Strikeforce: Nashville”] a couple of weeks before,” Coker told Sherdog.com on Monday. Daley owns an impressive 23-9-2 professional record and has finished 18 by some form of knockout, so he’s clearly got skills. As we all know in the forgiving world of professional sports, talent usually wins-out and second chances are given out like candy. “When cooler heads prevail, maybe [the UFC will] be able to work something out with Paul, but I’m sure Paul will be on some heavy type of suspension from the commission up in Canada and I don’t imagine Paul being able to fight anytime soon,” said Coker. Daley was one of the contracts Coker didn’t acquire from their purchase of ProElite in early 2009. When asked if he would consider bringing the controversial welterweight to his organization, the charismatic promoter took a wait-and-see approach, however didn’t appear too keen on the idea.